← What are the Best flowers for Administrative Professionals Day? Since the beginning of freshman year, you have most likely dreamed of your junior or senior prom, and the gorgeous corsages that you get to wear! Experiencing a wonderful evening, dressing up in the most beautiful gown you can find, and dancing for hours with that special someone…you certainly will be excited. 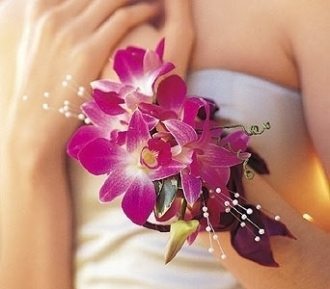 However, the corsages will be the one detail that will entirely complete your ensemble, and should be chosen with care. Matching your date’s boutonniere. Matching the boutonniere with the corsage will help you show that you are together for prom and create a cohesive look. You can create a boutonniere that looks as if you had plucked it straight out of the corsage for your date. We take the time to create cohesive arrangements so that you can match one another beautifully. Feel the Beat. To add a more dramatic flair to your prom attire, you can accessorize with our Feel the Beat Corsage. This beauty features blue hydrangeas, accompanied by purple stock and bear grass with rhinestone touches. We love the elegance that this beauty provides! Matching your dress. Your dress is your main piece to your prom attire and should provide inspiration for your accessories. The most obvious way to match your corsage and dress is to choose the dominant color of your dress for your flowers. Just provide us with a picture of your gown, and we can present with gorgeous floral options for your corsage. Rose Bloom. For a soft accessory to your dress, you can choose our Rose Bloom Corsage, which features spray lavender roses, with accents of lush greens and amethyst rhinestones. What an elegant display of color! Don’t you agree? A little advice for the perfect corsage. When shopping for your corsage, provide pictures to your florist of your dress and tie colors, so that yours can pair gorgeously with your ensembles. Also, shop a little early if you have time, so that the perfect corsage can be created for your prom! White Spray Rose Corsage. 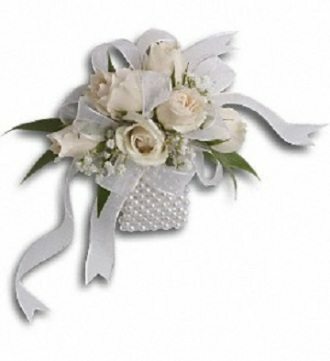 For those who enjoy the finer things in life, such as pearls and roses, we have a wonderful corsage for you! Our White Spray Rose Corsage features classic white roses and an elegant faux pearl cuff, allowing you to arrive to your prom with luxurious style, which we think is fabulous! These corsages are just some of the many that our Austin, Texas florist, Texas Blooms & Gifts, offers. 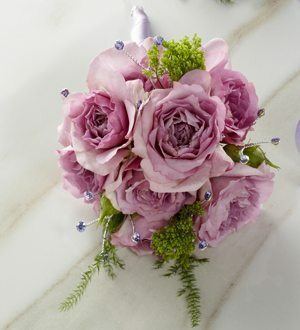 If you are ready to design your gorgeous prom flowers, please feel free to contact us today to get started. 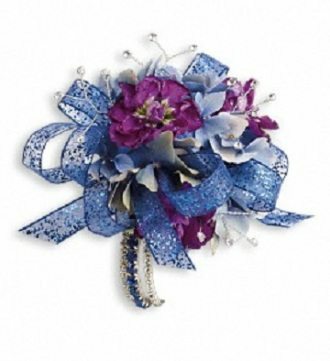 This entry was posted in flowers and tagged corsages, Corsages: Everything You Need to Know for Prom, Prom, Prom Flowers, Texas Blooms. Bookmark the permalink.